Download "ASIAN DEVELOPMENT FUND (ADF) ADF X MIDTERM REVIEW MEETING. Update on the Status of Debt Relief"
2 ABBREVIATIONS ADB Asian Development Bank ADF Asian Development Fund HIPC Heavily Indebted Poor Countries IDA International Development Association IMF International Monetary Fund Lao PDR Lao People s Democratic Republic NPV net present value GLOSSARY Common reduction factor Completion point Decision point The proportion of debt relief that must be granted (in net present value terms) to bring a country s debt indicators below the thresholds of the HIPC Initiative. For a post-decision-point country to reach the completion point, it must (i) maintain macroeconomic stability under a program supported by a poverty reduction and growth facility, (ii) carry out key structural and social reforms, and (iii) implement a poverty reduction strategy satisfactorily for at least 1 year. Following approval by the IDA and IMF boards, a country reaches the completion point and debt relief becomes irrevocable. To reach the decision point, a country should have (i) a track record of macroeconomic stability, (ii) prepared an interim poverty reduction strategy through a participatory process, and (iii) cleared any outstanding arrears. The amount of debt relief necessary to bring the country s debt indicators to the HIPC Initiative thresholds is calculated, and the country begins receiving interim debt relief on a provisional basis. Interim period The period between the decision point and the completion point. NOTE In this report, "$" refers to US dollars. In preparing any country program or strategy, financing any project, or by making any designation of or reference to a particular territory or geographic area in this document, the Asian Development Bank does not intend to make any judgments as to the legal or other status of any territory or area. 5 EXECUTIVE SUMMARY This paper provides an update on the status of debt relief from the Asian Development Fund (ADF), particularly on debt relief to Afghanistan, under the Heavily Indebted Poor Countries (HIPC) Initiative. The International Development Association (IDA) and the International Monetary Fund (IMF) launched the HIPC Initiative in The initiative provides partial debt relief to poor countries with levels of external debt that severely burden public finance and the balance of payments. In 1999, the initiative was enhanced to enable more countries to qualify for HIPC debt relief. Of the ADF countries potentially eligible for HIPC debt relief, Afghanistan became eligible for such debt relief and reached the decision point under the enhanced HIPC Initiative on 9 July The Asian Development Bank (ADB) received a request from the World Bank and the IMF to participate in the debt relief to Afghanistan under the enhanced HIPC Initiative. In April 2008, the ADB Board of Governors and Board of Directors approved a paper entitled Policy for Providing Heavily Indebted Poor Countries Relief from Asian Development Fund Debt and Proposed Debt Relief to Afghanistan. 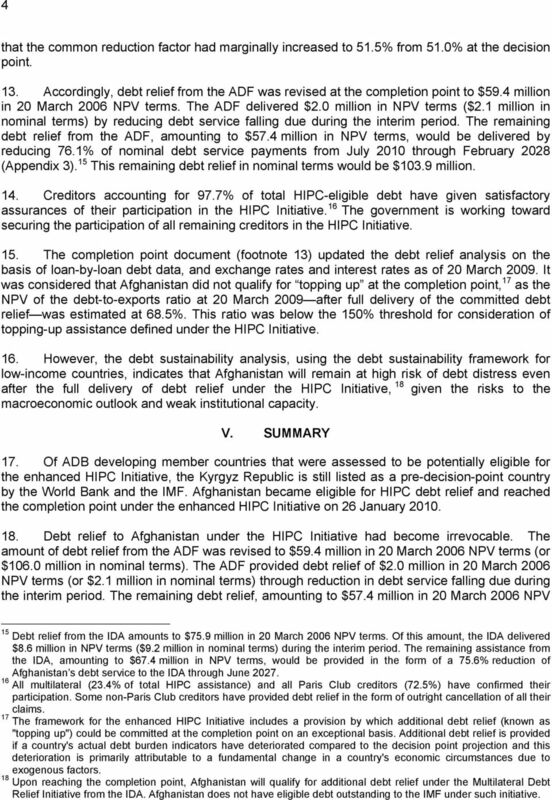 The HIPC debt relief from the ADF to Afghanistan was estimated to be $58.8 million in net present value (NPV) terms, or $104.9 million in nominal terms. The delivery of debt relief to Afghanistan was aligned with the approach of the IDA. About 75% would be deducted from the debt service payments on the outstanding balance as they come due during That outstanding balance was the outstanding and disbursed amount as of 20 March Interim assistance began with payments due in April 2008 following the approval to provide debt relief under the enhanced HIPC Initiative. It is currently expected that HIPC debt relief from the ADF will only be to Afghanistan. However, the World Bank and the IMF still list the Kyrgyz Republic as a pre-decision-point country. On financing the cost of HIPC debt relief, the ADF X Donors' Report stated: The lost reflows from the provision of HIPC debt relief are small enough during ADF X not to require specific earmarking of funds for this purpose. This issue will be reviewed in future replenishments. While the lost reflows from the provision of HIPC debt relief to Afghanistan during ADF X ( ) would amount to $4.1 million, the lost reflows during ADF XI ( ) would increase significantly to $23.6 million. Afghanistan reached the completion point under the enhanced HIPC Initiative on 26 January HIPC Debt relief to Afghanistan became irrevocable. The amount of debt relief from the ADF was revised to $59.4 million in 20 March 2006 NPV terms (or $106.0 million in nominal terms). The ADF provided debt relief of $2.0 million in NPV terms (or $2.1 million in nominal terms) by reducing debt service falling due during the interim period. 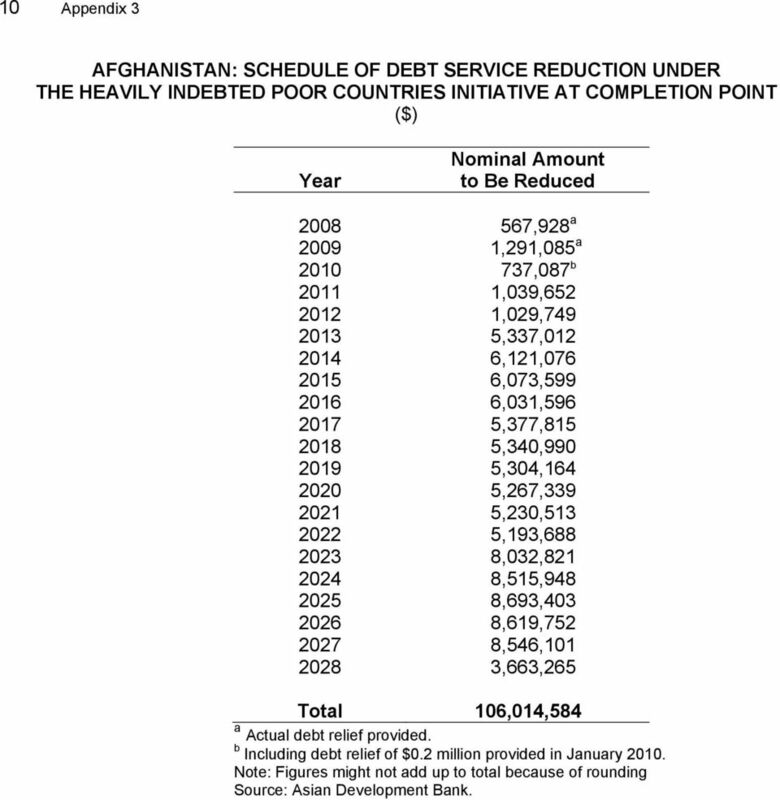 The remaining debt relief, totaling $57.4 million in 20 March 2006 NPV terms (or $103.9 million in nominal terms), will be provided by reducing Afghanistan s debt service from July 2010 to February 2028. 7 I. INTRODUCTION 1. This paper provides an update on the status of debt relief from the Asian Development Fund (ADF), particularly on debt relief to Afghanistan, under the enhanced Heavily Indebted Poor Countries (HIPC) Initiative. HIPC is a multilateral initiative which aims to ensure that no poor country faces a debt burden it cannot manage. 1 II. BACKGROUND A. 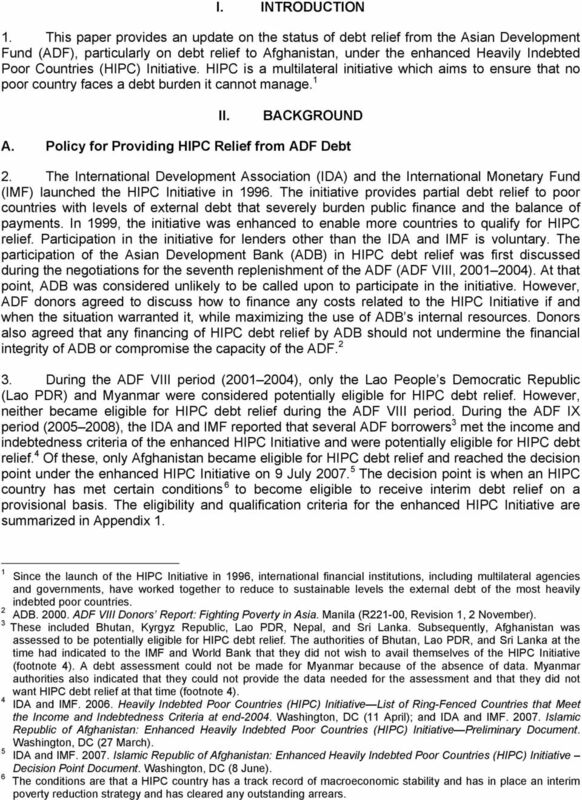 Policy for Providing HIPC Relief from ADF Debt 2. The International Development Association (IDA) and the International Monetary Fund (IMF) launched the HIPC Initiative in The initiative provides partial debt relief to poor countries with levels of external debt that severely burden public finance and the balance of payments. In 1999, the initiative was enhanced to enable more countries to qualify for HIPC relief. Participation in the initiative for lenders other than the IDA and IMF is voluntary. The participation of the Asian Development Bank (ADB) in HIPC debt relief was first discussed during the negotiations for the seventh replenishment of the ADF (ADF VIII, ). At that point, ADB was considered unlikely to be called upon to participate in the initiative. However, ADF donors agreed to discuss how to finance any costs related to the HIPC Initiative if and when the situation warranted it, while maximizing the use of ADB s internal resources. Donors also agreed that any financing of HIPC debt relief by ADB should not undermine the financial integrity of ADB or compromise the capacity of the ADF During the ADF VIII period ( ), only the Lao People s Democratic Republic (Lao PDR) and Myanmar were considered potentially eligible for HIPC debt relief. However, neither became eligible for HIPC debt relief during the ADF VIII period. During the ADF IX period ( ), the IDA and IMF reported that several ADF borrowers 3 met the income and indebtedness criteria of the enhanced HIPC Initiative and were potentially eligible for HIPC debt relief. 4 Of these, only Afghanistan became eligible for HIPC debt relief and reached the decision point under the enhanced HIPC Initiative on 9 July The decision point is when an HIPC country has met certain conditions 6 to become eligible to receive interim debt relief on a provisional basis. The eligibility and qualification criteria for the enhanced HIPC Initiative are summarized in Appendix 1. 1 Since the launch of the HIPC Initiative in 1996, international financial institutions, including multilateral agencies and governments, have worked together to reduce to sustainable levels the external debt of the most heavily indebted poor countries. 2 ADB ADF VIII Donors Report: Fighting Poverty in Asia. Manila (R221-00, Revision 1, 2 November). 3 These included Bhutan, Kyrgyz Republic, Lao PDR, Nepal, and Sri Lanka. Subsequently, Afghanistan was assessed to be potentially eligible for HIPC debt relief. The authorities of Bhutan, Lao PDR, and Sri Lanka at the time had indicated to the IMF and World Bank that they did not wish to avail themselves of the HIPC Initiative (footnote 4). A debt assessment could not be made for Myanmar because of the absence of data. Myanmar authorities also indicated that they could not provide the data needed for the assessment and that they did not want HIPC debt relief at that time (footnote 4). 4 IDA and IMF Heavily Indebted Poor Countries (HIPC) Initiative List of Ring-Fenced Countries that Meet the Income and Indebtedness Criteria at end Washington, DC (11 April); and IDA and IMF Islamic Republic of Afghanistan: Enhanced Heavily Indebted Poor Countries (HIPC) Initiative Preliminary Document. Washington, DC (27 March). 5 IDA and IMF Islamic Republic of Afghanistan: Enhanced Heavily Indebted Poor Countries (HIPC) Initiative Decision Point Document. Washington, DC (8 June). 6 The conditions are that a HIPC country has a track record of macroeconomic stability and has in place an interim poverty reduction strategy and has cleared any outstanding arrears. 8 2 4. During the ADF IX midterm review meeting in Frankfurt, Germany, on 4 5 December 2006, ADF donors voiced their support for ADB s participation in the enhanced HIPC Initiative. While proposing recourse to the use of internal resources, they also reaffirmed the need to maintain the financial viability of ADF and not to impair future support for ADF countries. 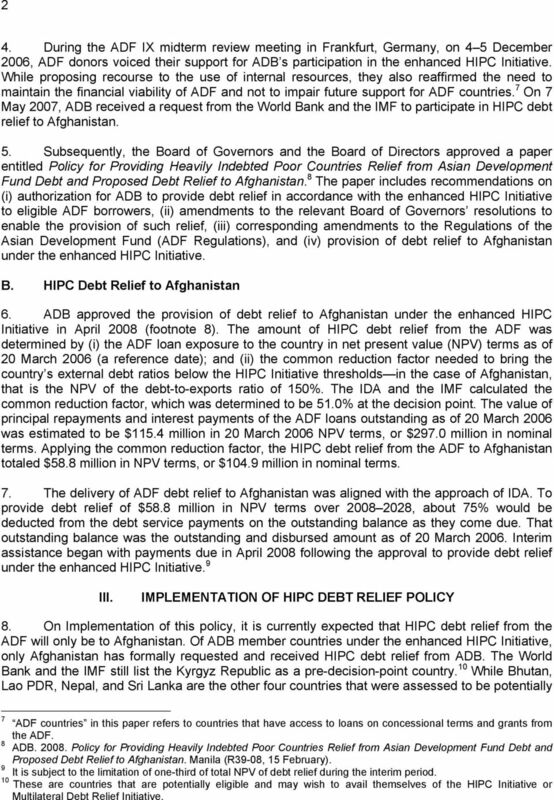 7 On 7 May 2007, ADB received a request from the World Bank and the IMF to participate in HIPC debt relief to Afghanistan. 5. Subsequently, the Board of Governors and the Board of Directors approved a paper entitled Policy for Providing Heavily Indebted Poor Countries Relief from Asian Development Fund Debt and Proposed Debt Relief to Afghanistan. 8 The paper includes recommendations on (i) authorization for ADB to provide debt relief in accordance with the enhanced HIPC Initiative to eligible ADF borrowers, (ii) amendments to the relevant Board of Governors resolutions to enable the provision of such relief, (iii) corresponding amendments to the Regulations of the Asian Development Fund (ADF Regulations), and (iv) provision of debt relief to Afghanistan under the enhanced HIPC Initiative. B. HIPC Debt Relief to Afghanistan 6. 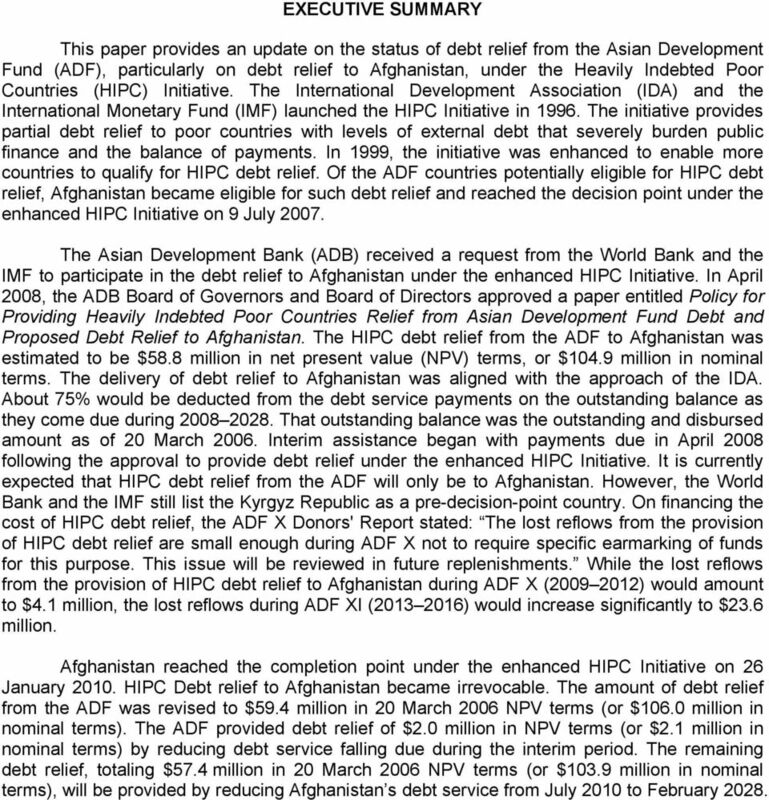 ADB approved the provision of debt relief to Afghanistan under the enhanced HIPC Initiative in April 2008 (footnote 8). The amount of HIPC debt relief from the ADF was determined by (i) the ADF loan exposure to the country in net present value (NPV) terms as of 20 March 2006 (a reference date); and (ii) the common reduction factor needed to bring the country s external debt ratios below the HIPC Initiative thresholds in the case of Afghanistan, that is the NPV of the debt-to-exports ratio of 150%. The IDA and the IMF calculated the common reduction factor, which was determined to be 51.0% at the decision point. The value of principal repayments and interest payments of the ADF loans outstanding as of 20 March 2006 was estimated to be $115.4 million in 20 March 2006 NPV terms, or $297.0 million in nominal terms. Applying the common reduction factor, the HIPC debt relief from the ADF to Afghanistan totaled $58.8 million in NPV terms, or $104.9 million in nominal terms. 7. The delivery of ADF debt relief to Afghanistan was aligned with the approach of IDA. To provide debt relief of $58.8 million in NPV terms over , about 75% would be deducted from the debt service payments on the outstanding balance as they come due. That outstanding balance was the outstanding and disbursed amount as of 20 March Interim assistance began with payments due in April 2008 following the approval to provide debt relief under the enhanced HIPC Initiative. 9 III. 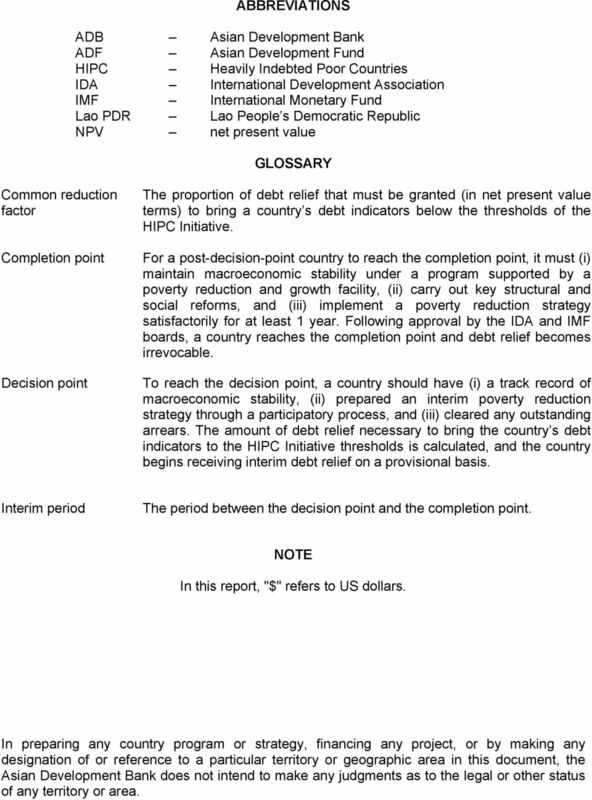 IMPLEMENTATION OF HIPC DEBT RELIEF POLICY 8. On Implementation of this policy, it is currently expected that HIPC debt relief from the ADF will only be to Afghanistan. Of ADB member countries under the enhanced HIPC Initiative, only Afghanistan has formally requested and received HIPC debt relief from ADB. The World Bank and the IMF still list the Kyrgyz Republic as a pre-decision-point country. 10 While Bhutan, Lao PDR, Nepal, and Sri Lanka are the other four countries that were assessed to be potentially 7 ADF countries in this paper refers to countries that have access to loans on concessional terms and grants from the ADF. 8 ADB Policy for Providing Heavily Indebted Poor Countries Relief from Asian Development Fund Debt and Proposed Debt Relief to Afghanistan. Manila (R39-08, 15 February). 9 It is subject to the limitation of one-third of total NPV of debt relief during the interim period. 10 These are countries that are potentially eligible and may wish to avail themselves of the HIPC Initiative or Multilateral Debt Relief Initiative. 9 3 eligible for the enhanced HIPC Initiative, they have indicated in writing to the IDA and IMF staffs that they would not avail themselves of the initiative. Hence, they are not included in the list of pre-decision-point countries. Myanmar still could not be assessed because data is unavailable. As such, Myanmar is also not included in the list. 9. It is acknowledged that HIPC debt relief has negative effect on ADF s financial capacity. On financing the cost of HIPC debt relief, the ADF X Donors' Report stated: The lost reflows from the provision of HIPC debt relief are small enough during ADF X not to require specific earmarking of funds for this purpose. This issue will be reviewed in future replenishments. 11 Donors also reiterated that financing the costs of HIPC debt relief should maximize the use of ADB's internal resources, while ensuring its financial integrity and not compromising the ADF s capacity. While the lost reflows from the provision of HIPC debt relief to Afghanistan during ADF X ( ) would amount to $4.1 million, the lost reflows during ADF XI ( ) would increase significantly to $23.6 million. IV. 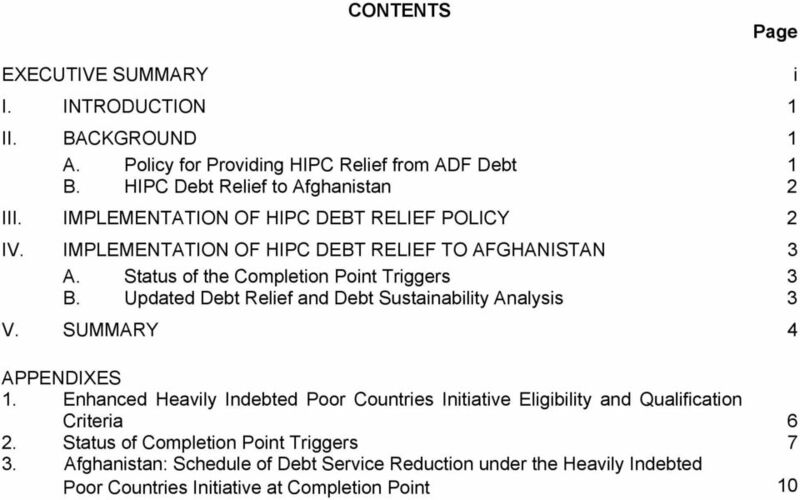 IMPLEMENTATION OF HIPC DEBT RELIEF TO AFGHANISTAN A. Status of the Completion Point Triggers 10. Afghanistan reached the completion point under the enhanced HIPC Initiative on 26 January The assessment of Afghanistan's progress in meeting the HIPC completion point triggers is in Appendix The IDA and IMF considered that Afghanistan had successfully implemented the necessary key reforms despite exceptional challenges, including a deteriorating security situation. Of the 11 triggers, nine had been fully implemented. For the other two triggers restructuring of key service delivery ministries and civil service and military pensions the IDA and IMF determined that substantial progress had been made, and the government indicated that it would continue pursuing reforms to complete these two triggers. The boards of the executive directors of the IDA and IMF approved the government s request for waivers of the two triggers, and the completion point was achieved. B. Updated Debt Relief and Debt Sustainability Analysis 11. The stock of debt data as of 20 March 2006 were reviewed at the completion point against the latest creditor statements. This debt reconciliation exercise concluded that the nominal stock of debt had been revised upward by $22.6 million to $11,962.1 million. The NPV of debt as of 20 March 2006, after traditional debt relief, had been revised upward by $11.1 million to $1,131.1 million. The nominal amounts of debt owed to multilateral creditors remained the same, while Paris Club debt had been revised downward and other official bilateral and commercial debts had been revised upward. 12. The HIPC assistance in NPV terms was also revised upward to $582.4 million so that the NPV of eligible external debt is reduced to 150% of exports at 20 March This implied 11 ADB Asian Development Fund X Donors Report: Towards an Asia and Pacific Region Free of Poverty. Manila (May). 12 For a country to reach the completion point, it must (i) maintain macroeconomic stability under a program supported by a poverty reduction and growth facility, (ii) carry out key structural and social reforms, and (iii) implement a poverty reduction strategy satisfactorily for at least 1 year. 13 IDA and IMF Islamic Republic of Afghanistan: Enhanced Heavily Indebted Poor Countries (HIPC) Initiative Completion Point Document and Multilateral Debt Relief Initiative (MDRI). Washington, DC (14 January). 14 The estimates of the 2003/ /06 average of exports of goods and services at the decision point document remain the same at $365.7 million. 10 4 that the common reduction factor had marginally increased to 51.5% from 51.0% at the decision point. 13. 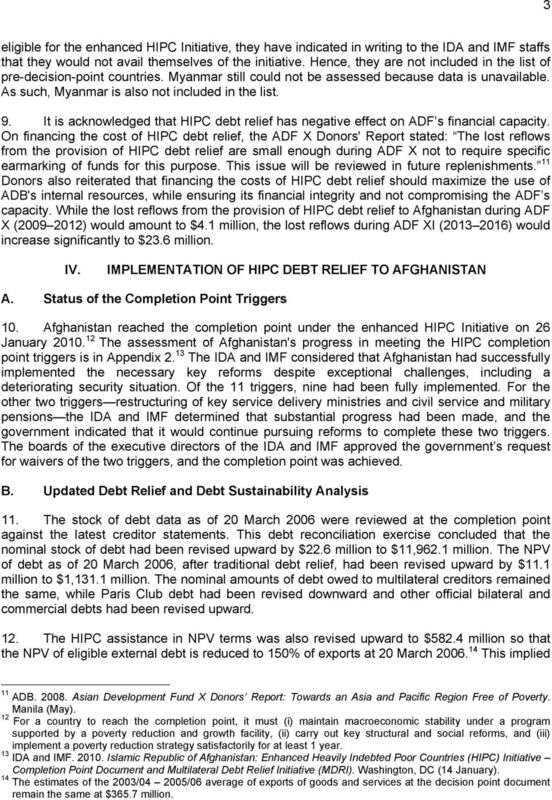 Accordingly, debt relief from the ADF was revised at the completion point to $59.4 million in 20 March 2006 NPV terms. The ADF delivered $2.0 million in NPV terms ($2.1 million in nominal terms) by reducing debt service falling due during the interim period. The remaining debt relief from the ADF, amounting to $57.4 million in NPV terms, would be delivered by reducing 76.1% of nominal debt service payments from July 2010 through February 2028 (Appendix 3). 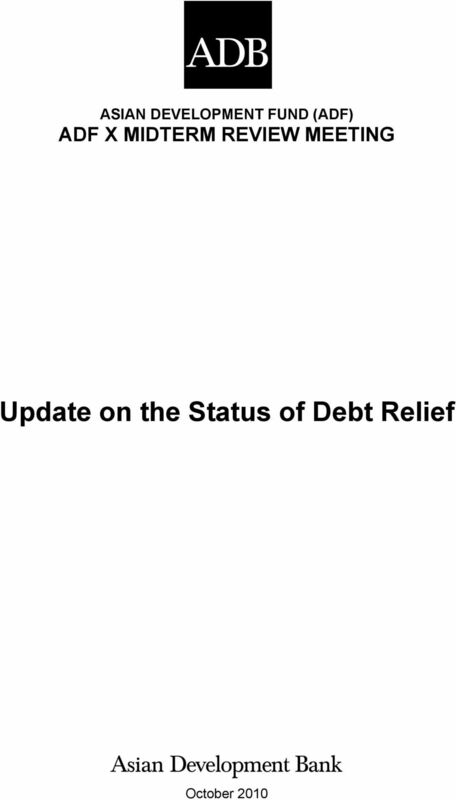 15 This remaining debt relief in nominal terms would be $103.9 million. 14. Creditors accounting for 97.7% of total HIPC-eligible debt have given satisfactory assurances of their participation in the HIPC Initiative. 16 The government is working toward securing the participation of all remaining creditors in the HIPC Initiative. 15. The completion point document (footnote 13) updated the debt relief analysis on the basis of loan-by-loan debt data, and exchange rates and interest rates as of 20 March It was considered that Afghanistan did not qualify for topping up at the completion point, 17 as the NPV of the debt-to-exports ratio at 20 March 2009 after full delivery of the committed debt relief was estimated at 68.5%. 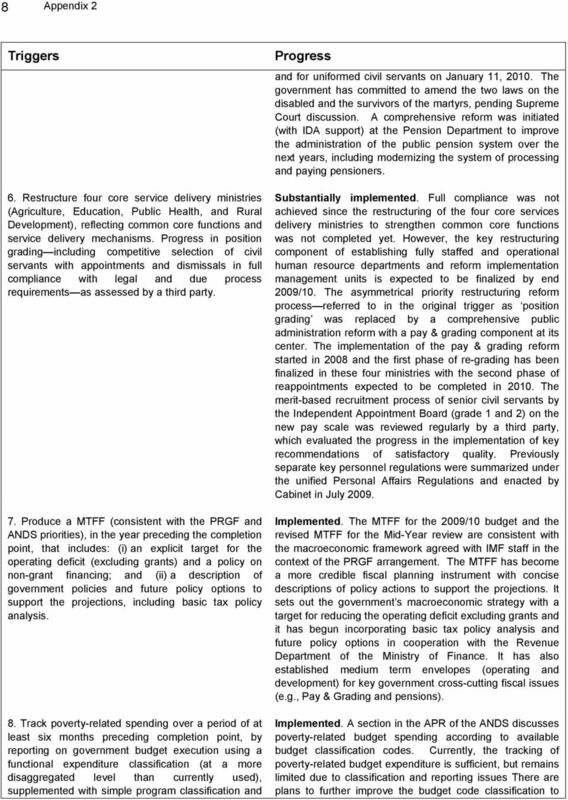 This ratio was below the 150% threshold for consideration of topping-up assistance defined under the HIPC Initiative. 16. However, the debt sustainability analysis, using the debt sustainability framework for low-income countries, indicates that Afghanistan will remain at high risk of debt distress even after the full delivery of debt relief under the HIPC Initiative, 18 given the risks to the macroeconomic outlook and weak institutional capacity. V. SUMMARY 17. Of ADB developing member countries that were assessed to be potentially eligible for the enhanced HIPC Initiative, the Kyrgyz Republic is still listed as a pre-decision-point country by the World Bank and the IMF. Afghanistan became eligible for HIPC debt relief and reached the completion point under the enhanced HIPC Initiative on 26 January Debt relief to Afghanistan under the HIPC Initiative had become irrevocable. The amount of debt relief from the ADF was revised to $59.4 million in 20 March 2006 NPV terms (or $106.0 million in nominal terms). The ADF provided debt relief of $2.0 million in 20 March 2006 NPV terms (or $2.1 million in nominal terms) through reduction in debt service falling due during the interim period. The remaining debt relief, amounting to $57.4 million in 20 March 2006 NPV 15 Debt relief from the IDA amounts to $75.9 million in 20 March 2006 NPV terms. Of this amount, the IDA delivered $8.6 million in NPV terms ($9.2 million in nominal terms) during the interim period. The remaining assistance from the IDA, amounting to $67.4 million in NPV terms, would be provided in the form of a 75.6% reduction of Afghanistan s debt service to the IDA through June All multilateral (23.4% of total HIPC assistance) and all Paris Club creditors (72.5%) have confirmed their participation. Some non-paris Club creditors have provided debt relief in the form of outright cancellation of all their claims. 17 The framework for the enhanced HIPC Initiative includes a provision by which additional debt relief (known as "topping up") could be committed at the completion point on an exceptional basis. Additional debt relief is provided if a country's actual debt burden indicators have deteriorated compared to the decision point projection and this deterioration is primarily attributable to a fundamental change in a country's economic circumstances due to exogenous factors. 18 Upon reaching the completion point, Afghanistan will qualify for additional debt relief under the Multilateral Debt Relief Initiative from the IDA. Afghanistan does not have eligible debt outstanding to the IMF under such initiative. 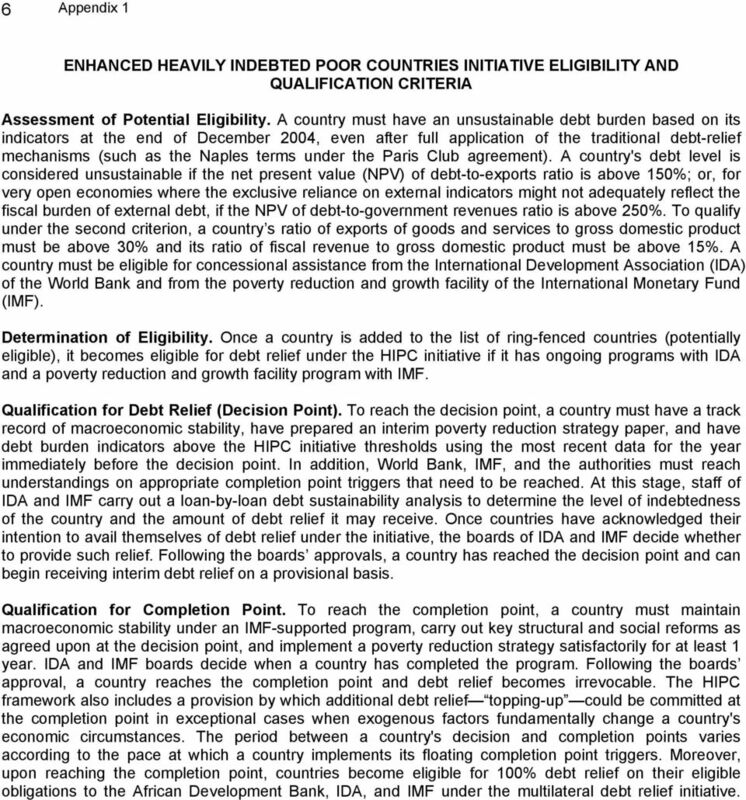 12 6 Appendix 1 ENHANCED HEAVILY INDEBTED POOR COUNTRIES INITIATIVE ELIGIBILITY AND QUALIFICATION CRITERIA Assessment of Potential Eligibility. A country must have an unsustainable debt burden based on its indicators at the end of December 2004, even after full application of the traditional debt-relief mechanisms (such as the Naples terms under the Paris Club agreement). A country's debt level is considered unsustainable if the net present value (NPV) of debt-to-exports ratio is above 150%; or, for very open economies where the exclusive reliance on external indicators might not adequately reflect the fiscal burden of external debt, if the NPV of debt-to-government revenues ratio is above 250%. To qualify under the second criterion, a country s ratio of exports of goods and services to gross domestic product must be above 30% and its ratio of fiscal revenue to gross domestic product must be above 15%. A country must be eligible for concessional assistance from the International Development Association (IDA) of the World Bank and from the poverty reduction and growth facility of the International Monetary Fund (IMF). Determination of Eligibility. Once a country is added to the list of ring-fenced countries (potentially eligible), it becomes eligible for debt relief under the HIPC initiative if it has ongoing programs with IDA and a poverty reduction and growth facility program with IMF. Qualification for Debt Relief (Decision Point). To reach the decision point, a country must have a track record of macroeconomic stability, have prepared an interim poverty reduction strategy paper, and have debt burden indicators above the HIPC initiative thresholds using the most recent data for the year immediately before the decision point. In addition, World Bank, IMF, and the authorities must reach understandings on appropriate completion point triggers that need to be reached. At this stage, staff of IDA and IMF carry out a loan-by-loan debt sustainability analysis to determine the level of indebtedness of the country and the amount of debt relief it may receive. Once countries have acknowledged their intention to avail themselves of debt relief under the initiative, the boards of IDA and IMF decide whether to provide such relief. Following the boards approvals, a country has reached the decision point and can begin receiving interim debt relief on a provisional basis. Qualification for Completion Point. To reach the completion point, a country must maintain macroeconomic stability under an IMF-supported program, carry out key structural and social reforms as agreed upon at the decision point, and implement a poverty reduction strategy satisfactorily for at least 1 year. IDA and IMF boards decide when a country has completed the program. Following the boards approval, a country reaches the completion point and debt relief becomes irrevocable. The HIPC framework also includes a provision by which additional debt relief topping-up could be committed at the completion point in exceptional cases when exogenous factors fundamentally change a country's economic circumstances. The period between a country's decision and completion points varies according to the pace at which a country implements its floating completion point triggers. Moreover, upon reaching the completion point, countries become eligible for 100% debt relief on their eligible obligations to the African Development Bank, IDA, and IMF under the multilateral debt relief initiative. 15 Appendix 2 9 Triggers reporting in key ministries. 9. 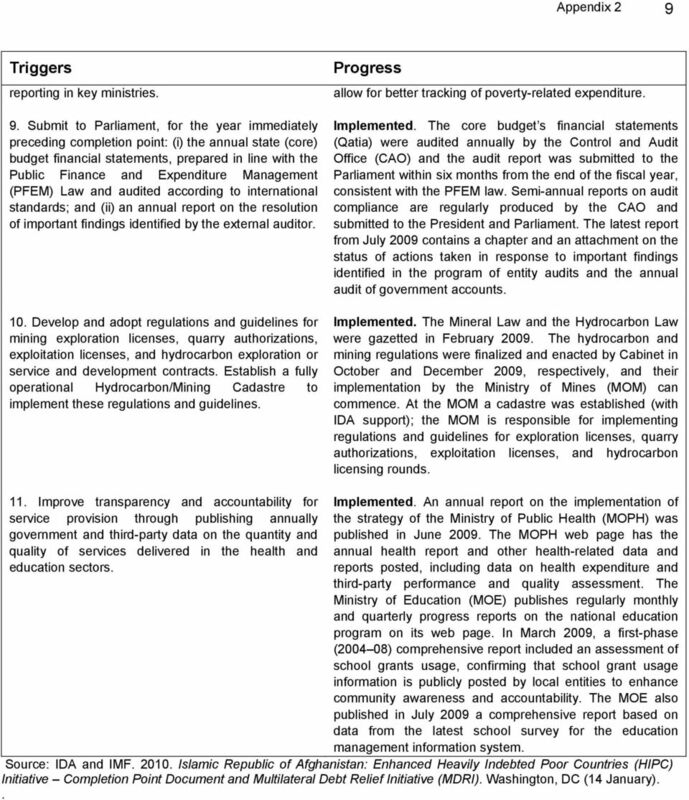 Submit to Parliament, for the year immediately preceding completion point: (i) the annual state (core) budget financial statements, prepared in line with the Public Finance and Expenditure Management (PFEM) Law and audited according to international standards; and (ii) an annual report on the resolution of important findings identified by the external auditor. 10. Develop and adopt regulations and guidelines for mining exploration licenses, quarry authorizations, exploitation licenses, and hydrocarbon exploration or service and development contracts. Establish a fully operational Hydrocarbon/Mining Cadastre to implement these regulations and guidelines. Progress allow for better tracking of poverty-related expenditure. Implemented. The core budget s financial statements (Qatia) were audited annually by the Control and Audit Office (CAO) and the audit report was submitted to the Parliament within six months from the end of the fiscal year, consistent with the PFEM law. Semi-annual reports on audit compliance are regularly produced by the CAO and submitted to the President and Parliament. The latest report from July 2009 contains a chapter and an attachment on the status of actions taken in response to important findings identified in the program of entity audits and the annual audit of government accounts. Implemented. The Mineral Law and the Hydrocarbon Law were gazetted in February The hydrocarbon and mining regulations were finalized and enacted by Cabinet in October and December 2009, respectively, and their implementation by the Ministry of Mines (MOM) can commence. At the MOM a cadastre was established (with IDA support); the MOM is responsible for implementing regulations and guidelines for exploration licenses, quarry authorizations, exploitation licenses, and hydrocarbon licensing rounds. 11. Improve transparency and accountability for service provision through publishing annually government and third-party data on the quantity and quality of services delivered in the health and education sectors. Implemented. An annual report on the implementation of the strategy of the Ministry of Public Health (MOPH) was published in June The MOPH web page has the annual health report and other health-related data and reports posted, including data on health expenditure and third-party performance and quality assessment. The Ministry of Education (MOE) publishes regularly monthly and quarterly progress reports on the national education program on its web page. In March 2009, a first-phase ( ) comprehensive report included an assessment of school grants usage, confirming that school grant usage information is publicly posted by local entities to enhance community awareness and accountability. The MOE also published in July 2009 a comprehensive report based on data from the latest school survey for the education management information system. Source: IDA and IMF Islamic Republic of Afghanistan: Enhanced Heavily Indebted Poor Countries (HIPC) Initiative Completion Point Document and Multilateral Debt Relief Initiative (MDRI). 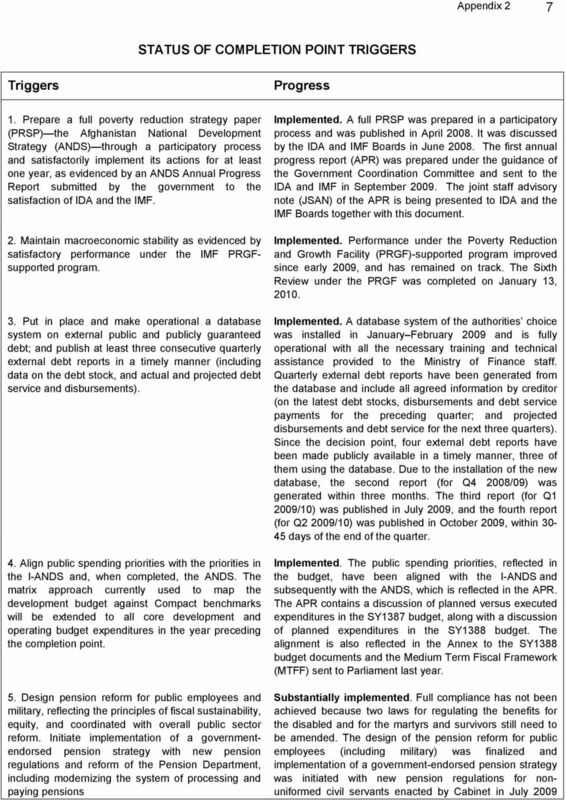 Washington, DC (14 January)..
16 10 Appendix 3 AFGHANISTAN: SCHEDULE OF DEBT SERVICE REDUCTION UNDER THE HEAVILY INDEBTED POOR COUNTRIES INITIATIVE AT COMPLETION POINT ($) Year Nominal Amount to Be Reduced ,928 a ,291,085 a ,087 b ,039, ,029, ,337, ,121, ,073, ,031, ,377, ,340, ,304, ,267, ,230, ,193, ,032, ,515, ,693, ,619, ,546, ,663,265 Total 106,014,584 a Actual debt relief provided. b Including debt relief of $0.2 million provided in January Note: Figures might not add up to total because of rounding Source: Asian Development Bank. MDRI HIPC. heavily indebted poor countries initiative. To provide additional support to HIPCs to reach the MDGs. This note provides additional information to understand the Debt Relief statistics reported in the GPEX Tables. Is China Actually Helping Improve Debt Sustainability in Africa?